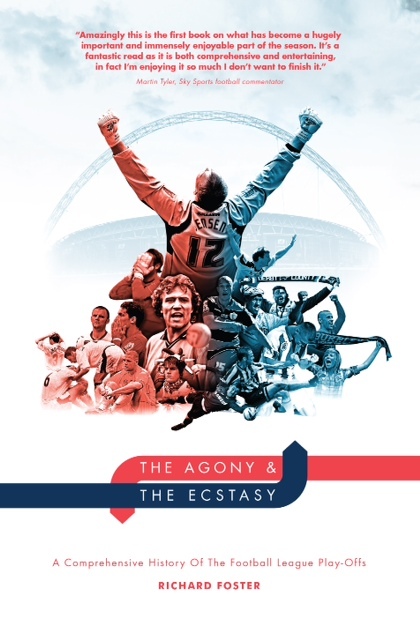 In this lecture, timed to coincide with the launch of the paperback edition of his book The Agony & The Ecstasy, writer and journalist Richard Foster tells the story of the English Football League Play-Offs. At a value estimated to be well in excess of £130 million for the winner, The Football League Championship Play-Offs Final is the richest single sporting match in the world. When the next English Premier League television deal kicks in at the start of the 2016/17 season that figure could well top £200 million. But when the concept was introduced almost 30 years ago it was considered a stop-gap measure that was unlikely to last its trial period of a couple of years. That the Play-Offs are now considered to be one of the most important parts of the league calendar is a testament to their longevity and enduring appeal. In his book The Agony & The Ecstasy, writer and journalist Richard Foster delves into the intriguing history, explaining why the Play-Offs were introduced amid the dismal, dreadful events of 1985; Foster explores why they have become so successful with almost everyone involved in football including players, managers and most of importantly, fans; finally, he speculates on whether the time has come to re-assess the format of the Play-Offs. The following extract from the introduction to the book offers a flavour of the issues that Richard will follow in his presentation on the launch of the paperback edition of The Agony & The Ecstasy. The hallmark of the Play-Offs is their ability to stir emotions and encourage the strongest opinions on both sides of the divide. When a chairman from the losing side describes them as “the best invention ever”, whilst a winning manager asks for them to “be scrapped immediately”, you can appreciate that you are dealing with an unusual animal. No other football match has so successfully combined the significant with the spectacular, the crucial with the dramatic, the ecstasy with the agony, in quite the manner that the Play-Offs have over the last three decades. Love them or hate them you simply cannot ignore them. The Play-Offs may not have the cachet of the Champions League, the traditions of the FA Cup or the allure of the Premier League, but at times, they can rival, even overshadow, these more illustrious competitions and punch well above their weight. Additionally, the Play-Offs have made the most positive and lasting impression on the landscape of English football over the last twenty-seven years. After their introduction as a system for deciding the last promotion slot for the three lower divisions of the Football League in the 1986/87 season, they have proved to be a key element in ensuring football’s standing as the most popular spectator sport in the country. Without their influence, the football industry may have gone down a radically different path and its position could have been undermined to such an extent that it might have surrendered its status as the national game. Despite their acknowledged importance, the Play-Offs still divide opinion into two distinct camps. The advocates view them as a suitably dramatic climax to the league season, a season that is considerably enlivened by the prospect of a handful of clubs battling to contest this eventful denouement to the bitter end. By providing teams, which might have previously been destined to mid-table mediocrity, with a real sense of purpose and an achievable aim, the Play-Offs have injected fresh impetus into many a club’s season. The critics talk of ‘a lottery’ by pointing to the inequality of a team finishing a few places and many points above a rival after a full league season and yet potentially losing out on promotion to that team with an inferior league record. Whilst there are plenty of hard-luck stories and this argument does have some credence, surely the numerous benefits outweigh any sense of injustice. Richard Foster is an Oxford University graduate who spent (too) many years working in sales & marketing in media, including a thirteen-year stint at the Financial Times. In 2006 he experienced an epiphany and, coupled with a full-blown mid-life crisis, became a journalist and writer. Since then he has become a regular football features writer for The Guardian, the Football League, The Set Pieces, Sabotage Times and a variety of Palace fanzines and blogs, including Five Year Plan, HLTCO & Holmesdale Radio. Foster has also appeared on talkSPORT, BBC London 94.9 and numerous podcasts, including The Whistleblowers, Palace Podcast and We Are Going Up. The A-Z of Football Hates, which was published in August 2014 and described by FourFourTwo as “prime on-throne fodder”. Talking Balls! – The greatest and funniest sports quotes of all time, was published in September 2015. Richard has conducted lengthy research into the Play-Offs and their far-reaching significance and is in discussions about a television documentary on the captivating story of the English Football League Play-Offs and the birth of the biggest money game in world sport. His support of Crystal Palace is unwavering, the rock on which his life is based, poor chap. Foster, R. (2013). The Play-Offs: All or Nothing. football-league.co.uk. Foster, R. (2014). The A-Z of Football Hates. Amberley Publishing. Foster, R. (2015). The Agony & The Ecstasy. Ockley Books. Foster, R. (2015). Talking Balls! Carlton Publishing Group.